Any proposal that includes "trade Carson Wentz" is not going to be looked upon favorably by anyone associated with the Eagles, fans included. The trading team would have to pay a serious excess price, and this isn't enough of an excess. The price for a young, demonstrated franchise QB, even one recovering from injury, is astronomical in this league. I know it's for fun and I get the questions about Wentz going forward but I think the part of the equation that's most lacking is the notion that the Eagles could actually get back to the Super Bowl in the next two seasons with Foles and/or one of the new drafted QBs, and that's what they are trying to do. I mean, they could, and they might not with Wentz either (especally if he's not the same this season), but lower odds. I think if they did do it you'd have to take the QB at #1. They got Wentz because they were sold on him specifically, 100%, and they'd probably have a clear favorite of those three guys, and couldn't afford to let him go 2nd (and especially not to the Giants). I don't think you spend $7 million on a QB for four weeks. You could go with Sudfield or sign someone else, go 2-2 or 3-1, and be okay (and you might still only go 2-2 with Foles). They have Foles in case Wentz is out for eight to 10 weeks, or if he gets hurt again. But they also have him because nobody made a good enough offer relative to all those needs. If everything works out it will still make sense to trade Foles at the deadline,assuming he played well. You still get a second or third, it just won't be for this season. I think you under-estimate RG III and over-estimate Wentz as passers. In his rookie season RG III was incredibly successful, putting up some amazing game QB-ratings, which Wentz hasn't equaled. RG III was never the same after the knee injury. We also have to consider what a dysfunctional Redskins organization RG III was part of. He still was rookie of the year, made the pro bowl, and led the Redskins to first division title in a while. Wentz's injury was at least as bad. Both RG III and Wentz benefited greatly from their abilities to run the ball and to elude rushers. The drives kept alive by Wentz completing a 3rd down on the ground or by QB-sneak on 4th down, or by eluding the rush long enough (and truly amazingly long) to get a long first down on 3rd-and-long are what seriously set Wentz apart from Foles. The added dimension of Wentz's mobility really opened up the passing game for him and made his offensive line look better than it was. We can't know if that dimension will return. I agree, we don't know when Wentz returns, which makes Foles all the more essential. It is an almost certainty that Wentz misses the whole pre-season, as RG III did. That has a negative impact when he does return, likely not for the first few games of the season, if the Eagles do right by his health. As I said, Wentz will not be traded. He has icon status in Philly and the rest of the league can't really have a good idea what they would be getting, but would have to assume he doesn't play the first 3 games of 2018. The biggest difference between RG3 and Wentz is temperament--Wentz doesn't need or even want to be the star, works harder than even the other hardest-working players on the Eagles, is allegedly over-prepared, is cooperative and coachable, and reacts well to set-backs. RG3 has had trouble in all of those areas. Plus Wentz has a ring. I almost added that to my comment, but was unsure when the trade deadline is, as I know it's early in football. You also may have better offers as quarterbacks go down to injury. I wouldnt trade Wentz for the entire Browns Organization, including the stadium and both fans. I don't want Wentz traded, but I'll play along. If you're going to trade a potential franchise QB for #1 and #4, then you have to take a QB with #1. I guess if you had 3 of Rosen, Darnold, Mayfield, and Allen rated equally, then you could take someone different at #1. But if that's the case, then I'd trade out of #1 as a RB simply isn't worth the 1st overall pick (even if he does seem like a great player). QB is just so much more important of a position and you have multiple teams stumbling over themselves to trade up and get one. If I were to make that trade with Cleveland, then I would turn around and shop the #1 pick to the Bills. Starting with #12, a 2nd this year, and a 1st next year. I'd take Barkley or Chubb at #4 (or even Minkah, but he seems to be slipping in some rankings... bad combine?). If Mayfield or Lamar Jackson are on the board at #12, then I take one of them. Otherwise, I look to extend Foles. Then go with LB/S/WR/TE with picks #35, #53, and #64 (pick #65 that was in the proposed trade is now property of the Bill from the Tyrod trade). Seems like a good way to make another playoff run next year and then hopefully roll with a new potential franchise QB in 2019 and plenty of talent around him. Eagles sign WR Mike Wallace. The 1 year deal is reported to be 2.5 million with incentives that could bring it up to 4 million. He's 32, but he is an upgrade over Torrey Smith for less money, another good move by Roseman. I highly recommend this piece on Mike Wallace from the Baltimore perspective. He is portrayed here as a player with something left in the tank, who also should fit in well in the Eagles' locker room. This is a good signing, to me. Mike Wallace spent two productive seasons with the Ravens. Now, he joins the reigning Super Bowl champs. Seems like a very good signing. Also, if he does well in Philly then there is the potential for a comp pick if he signs elsewhere after next season. Trading Torrey for a DB and signing a better WR at half the price is fantastic. I am a Mack Hollins fan and wanted to see his role grow this year, but this is a very good signing and doesn't impede Hollins being part of the future. Texas grand jury indicts Eagles defensive lineman Michael Bennett for injuring a 66-year-old paraplegic at the 2017 Super Bowl in Houston. 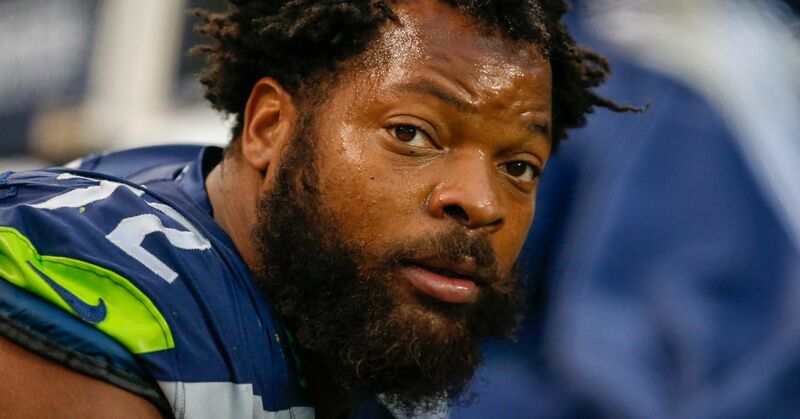 A Texas grand jury indicted Philadelphia Eagles defensive lineman Michael Bennett on Friday for injuring a 66-year-old paraplegic security staffer at the 2017 Super Bowl in Houston, according to a press release from the Harris County District Attorney's Office. Bennett has been charged with injury to the elderly, a felony punishable by up to 10 years in prison and a $10,000 fine, according to the release. "As a result of the indictment, a warrant has been issued for Bennett’s arrest," the district attorney's office said in the release. "Prosecutors are working with Bennett’s counsel regarding his surrender." Hear from the Houston PD Chief. Hard not to see this as political. If it isn't, one assumes he'll be able to make a deal (and that there is presumably a civil suit). Assuming that Bennett has a pretty clean record, I suspect you're right that there should be a deal to be made. But not sure why you also see this as clearly "political." You have someone filing a complaint who can presumably substantiate an injury. I've seen "he says\she says" arrests made in similar circumstances. Toss in an officer as a substantiating eye witness, and two other people who assert similar behavior in proximate time\locale, I'm not sure why a warrant seems inappropriate. Given the amount of time that has passed I'm just a little surprised that this wasn't handled before a felony warrant was necessary. I'm no Johnnie Cochran, but I have to think a defense attorney worth his/her salt could poke a lot of holes in the state's case here. While the grand jury process isn't always quick, the fact that it took 13 months - during which time Bennett had a very public run-in with law enforcement in Las Vegas and became nationally prominent for protesting law enforcement's treatment of African-Americans - doesn't smell especially good to me, and yes, if it was a white guy or a less prominent player I don't think there would have been a warrant and a press conference. On the flip side, if I'm a disabled, old black woman who gets pushed aside (with some significant force) as I'm just trying to do my screener\security job, have it witnessed by two other employees who are brusquely pushed aside by the same guy, have all three of us cussed out by the individual and have the whole thing observed by a police officer who recognizes the person as a pro bowl NFL player, I might just conclude that if nothing ever becomes of my complaint the "politics" involved in the justice system has very little to do with whether the player is a sitter, stander or kneeler. I agree, the fact that the police took no action on behalf of that women at the time of incident, or for nine months after that, and only opened an investigation three weeks after Bennett started making headlines, is also a travesty.